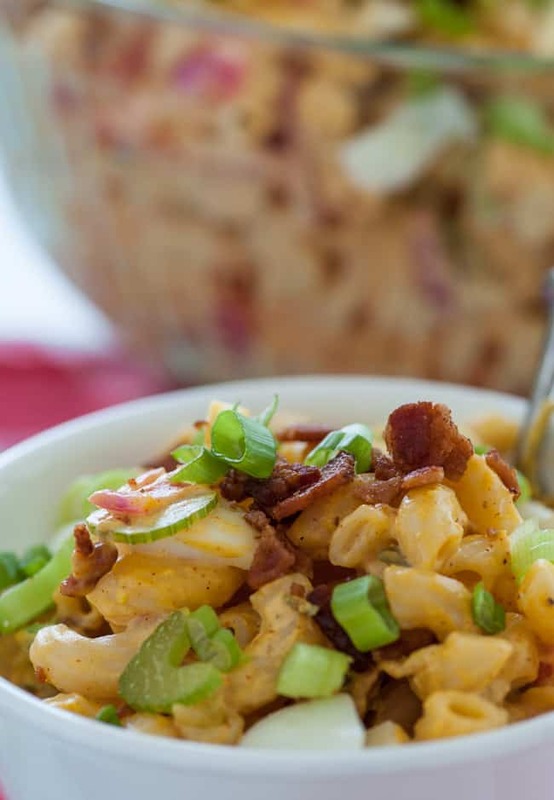 Here’s a recipe for a delicious macaroni deviled egg salad that would be the perfect thing to bring to a potluck dinner or have at a picnic or backyard party. About a week ago, Mary Jo picked up 2 dozen hard boiled eggs that were on sale for $4.99. That’s a super price for not having to boil and peel the eggs yourself. She got the eggs so she could bring deviled eggs to the Wednesday pool appetizer party we have in our park. Turns out it rained most of the day and it got a little chilly and we didn’t go to the pool. We ate the deviled eggs ourselves over the next two days. 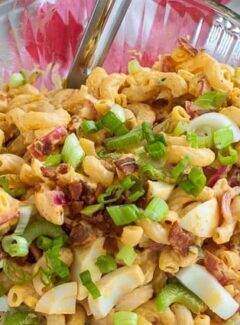 Since there were still a lot of boiled eggs in the fridge, I figured a macaroni deviled egg salad was in order. Who doesn’t like deviled eggs? For this salad you pretty much use the same spices and ingredients and you end up with a tasty side dish that’s just like deviled eggs. The one thing that I did a little differently was to add some bacon bits to the salad. 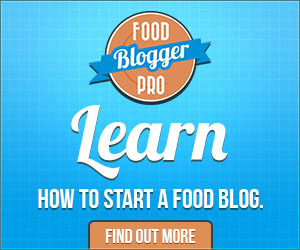 It’s an optional ingredient but adds a nice flavor and a good crunch. You’ll notice that I put water into the skillet with the bacon. I saw this tip in Cook’s Illustrated, tried it, and it really makes a difference. The fat in the bacon renders out without splattering since the water is only 212°. Then the bacon finishes cooking and is tender and crispy. When I brought the onion and vinegar up to temperature and took it off the heat, I had it sit for a couple hours since I got an early start on the recipe. The extra time in the vinegar made the onions do a quick pickling, softened the onions and made them taste really nice. It’s not necessary, but if you have the time, it is worth it. So…..
We’re having leftovers tonight with fried chicken…. I can’t wait. Perfect salad for a summertime meal or to share at a potluck dinner. The outstanding flavor is irresistible. Placed chopped bacon in a skillet with 1/4 cup of water, place on the stove on medium high heat and cook until all the water has evaporated and stir around until the bacon is crisp, 10 mins. Place the sliced onion, vinegar and sugar in a small skillet and bring to a simmer on medium heat, then set aside to cool. Halve the hard boiled eggs and place the yolks in a medium sized bowl and coarsely chop the whites and set aside. Using a fork, mash the egg yolks then add the spices, dill relish, mustard and mayonnaise and stir to combine. Taste and adjust seasonings as desired. 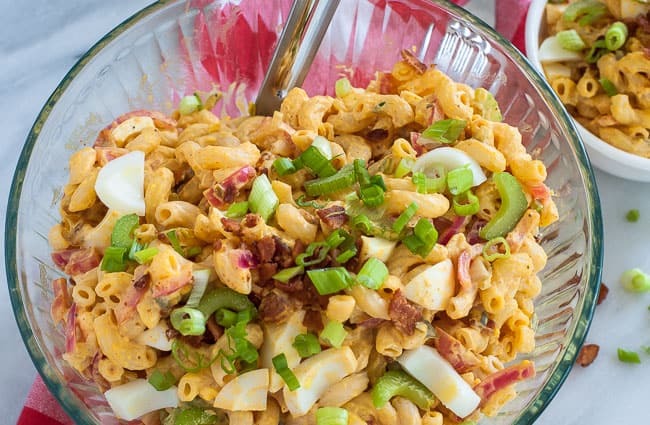 Place the cooked and cooled macaroni in a large bowl and pour in the egg yolk mixture and the onion and vinegar. Fold all ingredients together. Finally, fold in the celery, bacon and egg whites. (Reserve some bacon for garnish if desired). 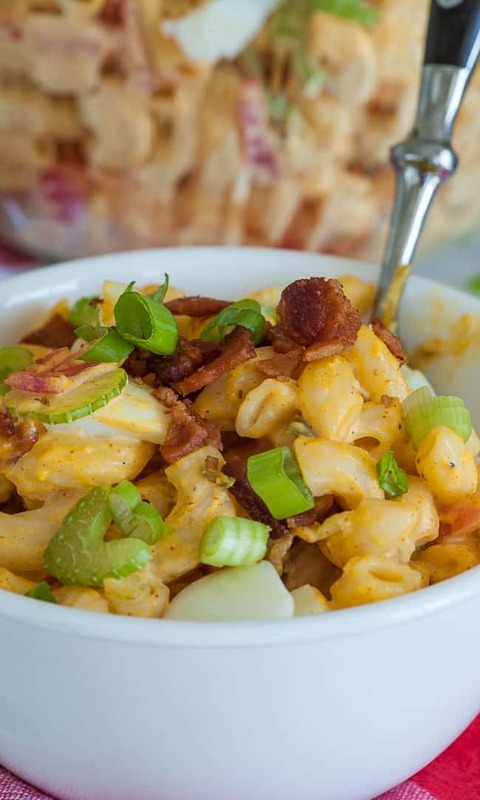 Serve cold and garnish with chopped green onion and reserved bacon. This is super all by itself, I don’t need any (although I really like it) fried chicken to accompany this great dish!!! Hi Al….just had some tonight and it is really good. I’m going to have to try this. It really sounds good! Hi Eileen..It is really a tasty dish. Yum yum yum yum!!! 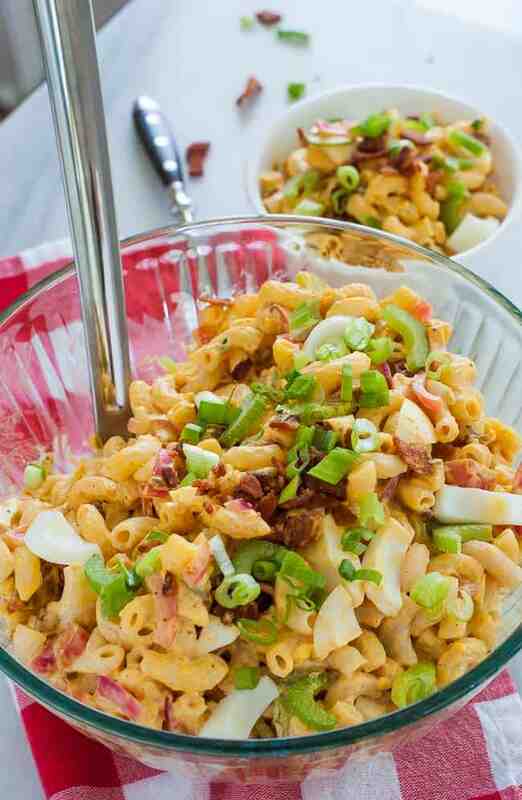 I loved the flavor of the onion after being simmered in the vinegar and the bacon put this right over the top for me. This is a dish I will want to eat several times this summer.